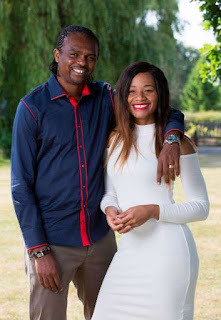 The wife of the ex arsenal and Nigerian star Amara nwankwo has taking up the social media to wish his husband kanu nwankwo happy birthday. Amara who is the wife of Super Eagles legend Kanu Nwankwo has taken to social media to celebrate the birthday of her lover who turned 42 on August 1, 2018. Kanu Nwankwo is the well known and respected former Nigeria internationals and many of his fans have showered birthday wishes on him on his birthday. The former Arsenal striker is the first Nigerian player to be named African Best Footballer twice after winning it in the year 1996 and 1999. His wife Amara who have celebrated 14 years wedding anniversary with kanu in July 2018 has however joined the train as she took to social media to celebrate the former Inter Milan striker. Kanu Nwankwo got married to his wife Amara in 2004 at Imo state and they are blessed with three children. We the staffs of newsgangs is wishing the man born on 1'st of August happy birthday.